It’s no secret that proper nutrition and exercise are the keys to burning fat and building a lean, strong body. But even when you’re eating right and working out regularly, there’s something more you could be doing to fast track your progress and maximize your fat loss results. Supplementing with CLA can help you reach your fitness goals faster by increasing your body’s fat-burning potential! Conjugated linoleic acid, or CLA, is a fatty acid that occurs naturally in grass-fed meat and dairy products from cows, goats, and sheep. In recent years the effects of consuming good fats has been widely researched, shedding light on the many health benefits. CLA is one of those good fats, and it may be the missing link to reaching your full fat loss potential! But even if you really like red meat and dairy products, getting a beneficial amount of CLA from your food alone can be difficult. There’s a better way to experience the benefits of CLA without eating a ton of extra calories to obtain it. You can take a CLA supplement! A CLA supplement for women can help you get the most out of your fitness and nutrition efforts by optimizing your fat burning ability, getting you closer to achieving your goals! CLA supplementation has been shown to result in an increased basal metabolic rate, which means an increased number of calories burned throughout the day. CLA has also been found to inhibit the storage of fat, and to reduce fat accumulation! This allows you to more effectively burn body fat, promoting a more lean composition! On top of the great fat loss benefits, recent research suggests that CLA may also be linked to more stable blood sugar levels and improved immune function! You can get even more benefits from a CLA supplement that also contains Safflower Oil, which is rich in Linoleic acid. Linoleic acid from sources like Safflower Oil may have a positive impact on heart health and can promote healthy skin and hair! So for optimal results, look for a CLA supplement that’s low in calories, contains added Safflower Oil, and has a daily dosage between 2,000-3,000mg. WHY SHOULD I USE IDEALLEAN CLA? CLA affects body fat levels by improving the metabolism of fat, helping to increase lean muscle mass, and by reducing fat storage pockets. 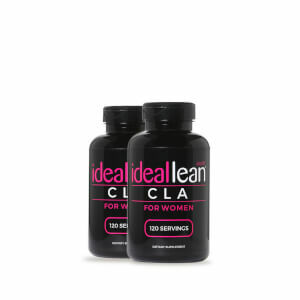 IdealLean’s highly concentrated CLA supplement capsules will help aid fat loss in two ways: first, it activates enzymes in your body that melt away body fat. Second, it suppresses your appetite, cutting down on cravings and helping you eat less. 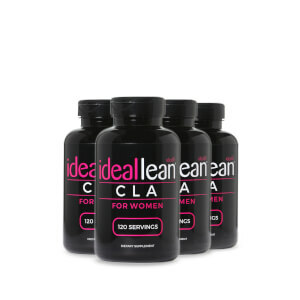 IdealLean CLA is formulated for active women, to help them get the most out of their nutrition and fitness efforts. 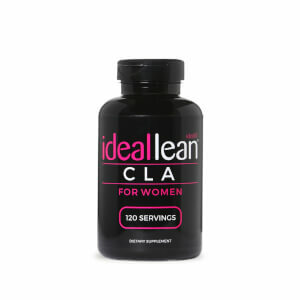 So put in some serious work, then let IdealLean CLA help maximize your weight loss and promote lean muscle growth. Can I view IdealLean CLA nutrition facts? Take up to three (3) capsules daily with 8 oz of water morning, noon, or night with a meal. How Much CLA Do I Need a Day? Studies show that taking between 1000mg-3400mg is the most effective dose. CLA is found in dairy, meat, or synthesized from sunflower and safflower oil. Why do I need to take this with meals? CLA is best consumed with a meal since one of the objectives is to reduce the amount of fat your body absorbs with every meal. Can I take this if I am Pregnant? As with any dietary supplement you should consult your physician before taking. If you miss a dose, don’t worry! Just pick right back up and take some at your next meal. What are the side effects of CLA? Although many people do not notice side effects from CLA supplements, there is a chance of some minor effects, especially if more than the recommended dose is taken. These side effects may include indigestion, heartburn, diarrhea, nausea, and fatigue. Recommended Intake is 2-7g. If any of these symptoms are felt discontinue taking or simply lower your dose. I notice that it contains salflower. I am allergic to all sunflowers, peanuts, nuts, are these in the same family? Can I take this? No they are not, Safflower is Carthamus Tinctorius L and Sunflowers are in the Genus Helianthus family. But please don’t leave it to chance and take the formula to your doctor to be absolutely certain. Can I take CLA on an empty stomach? It is not advised to take CLA on an empty stomach, as it can cause slight nausea and won’t be absorbed as efficiently. Results vary from person to person. CLA has been known to help in as little as a week and as long as a month. CLA can aid in the burning of fat without the use of stimulants. And both can be taken together. CLA lowers the melting point for fat burning, and blocks fat cells from growing bigger or swelling by influencing enzymes that affect fat growth. It can also increase the speed of fat burning.